The application process can seem complicated. Here, we break it down into simple steps with key dates and outline how you can help your child through the various stages of their application. Their school or college will also be involved in this and will offer support and guidance in the initial stages of the application. 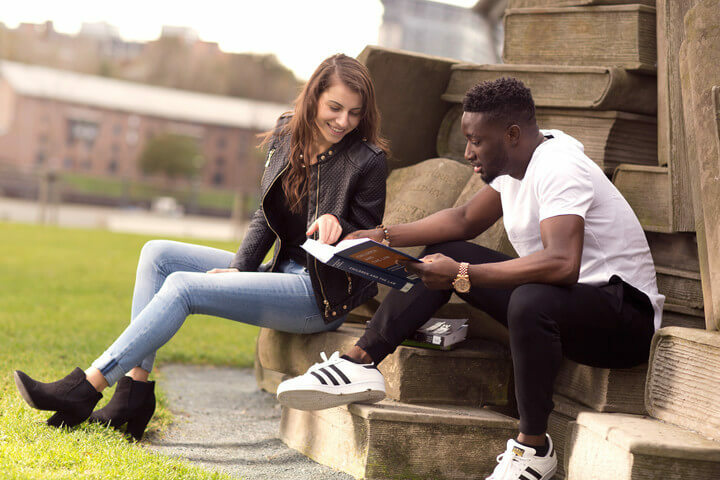 If your child is applying for a full-time undergraduate degree at a UK university, they will apply via the Universities Colleges Admissions Service (UCAS). The application process is the same for all UK universities, and follows a 7-step process. Use the course search at UCAS.com to find universities and courses, or search online for courses and broad topics of interest such as 'business degrees' or 'fine art higher education courses'. Choose some possible universities from this research, then request their prospectuses and/or look at their websites. Many universities now offer a downloadable prospectus. Create a shortlist of universities and visit their Open Days. Your child may wish to go with their friends, but parents are always welcome. We have a special friends and family zone at our Open Days where you can relax with refreshments or join in with any of the talks, tours and activities. On the day, your child will be primarily interested in the course and facilities, but you may wish to ask about accommodation, financial support, wellbeing and safety. Applicants can choose up to five universities when they apply. This gives a lot of flexibility and we would always advise them to choose options that will be available if they meet their predicted grades, but also at least one fallback choice in case they don't. Don't worry though, there are always other options available after an application has been submitted, such as Clearing. Applications can be made at any time from the September of Year 13 (or the second year of FE college) until 15 January. Don't forget to read our 'How to write the perfect personal statement' article before offering your services as a proofreader! When UCAS receives an application form, it will pass it on to your child's chosen universities. UCAS will send them a UCAS ID number, which they can use to track the progress of their application on the UCAS website. This number is vitally important – encourage them to keep the details safe and easily accessible. They should start receiving responses from universities between November and May. Your child or the university also has the option to withdraw the application during the process. See our jargon buster for more information on these terms. If your child receives one or more offers, they can make a decision on where to accept. They can make one firm acceptance, which is their preferred choice, and one insurance choice. The insurance choice typically has a lower tariff point requirement. If they accept an unconditional offer, they must decline all other offers. The deadline for making a decision will depend on the date they received the last offer. This is an important part of the process which you can support by reviewing the research done in step 1, thinking about pros and cons and encouraging an informed decision! Exam results are published in August. Once your child has confirmed their results and therefore tariff points, they will be able to check on the UCAS Track to see if they have been accepted by their chosen university. Many universities will also send an email or text message confirming acceptance. If your child did not meet the conditions of their offers, or didn't receive any offers, they could still find a place through Clearing. From late August / early September, universities will send out information about enrolling, accommodation and what to expect from the first few weeks. Then all that's left is to help pack and get them ready for a life-changing experience!